We show examples of architectural requirements in Figure 1 and simulation requirements in Figure 2. The third category is outside the scope of this TechNote and may be dependent on the specific urban community being investigated. Because our modeling effort is assumed to be collaborative, we must be ready to accommodate a range of modeling tools and repositories. For purposes of illustration, we assume that the architectural requirements have been captured in IBM Rational DOORS NG and the simulation requirements in Jama Connect, two different requirements management tools widely used for requirements generation and version-management. However, we also need to link these requirements both to each other and to other system model elements, in order to provide traceability and data access across tool and domain boundaries. 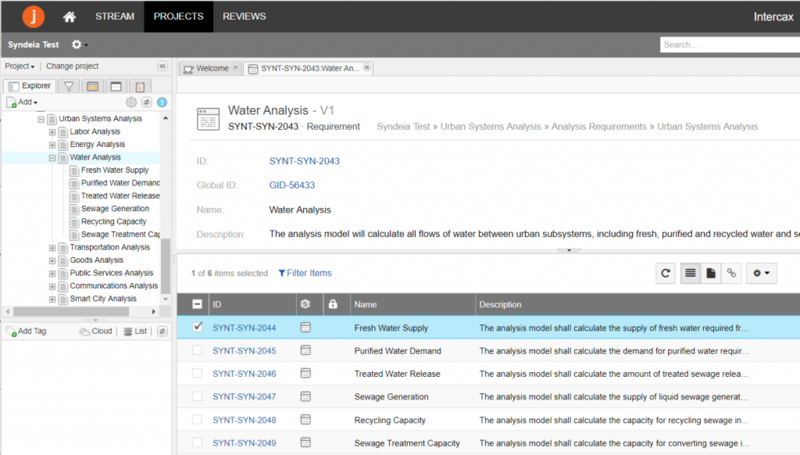 For this purpose, we use Syndeia, the MBSE interoperability platform from Intercax. Syndeia enables the modeler to build, maintain and analyze a network of connections across multiple engineering software models, creating a practical Total System Model (TSM) by federation of individual domain models. Model Transform – We can take elements or sets of elements in one model and transform them into equivalent elements in another, bringing across attributes and internal structure as needed. Because the elements remain connected, the elements may be compared and updated as one or both ends of the connection change over time. In Figure 3, we show how this might work in our system. The simulation requirements on the left, transformed from Jama Connect into IBM Rational Rhapsody are linked to the architectural requirements on the right, transformed from DOORS NG into Rhapsody through the standard SysML <<deriveReqt>> dependency. Reference – alternatively, we could have used Syndeia to create reference connections directly from requirements in DOORS NG to requirements in Jama. This would also have provided traceability, enabling users of one tool to access related elements in another or to recognize when a new version of the connected element has been committed. MBSE and Syndeia accommodate both approaches. The Reference connection obviates the need for a third tool and updating of shared data. Model Transform makes explicit the overall architecture of the TSM and uses a standard library of artifact and relationship types, which can enhance cross-discipline communication. As we will see, both approaches can be used in a complementary fashion in the same project. 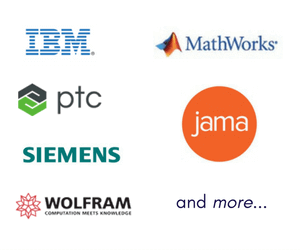 Model transforms will be used to connect Rhapsody, DOORS NG, Jama Connect and Simulink, while Reference connections will tie elements in these tools to JIRA issues for collaborative project management. 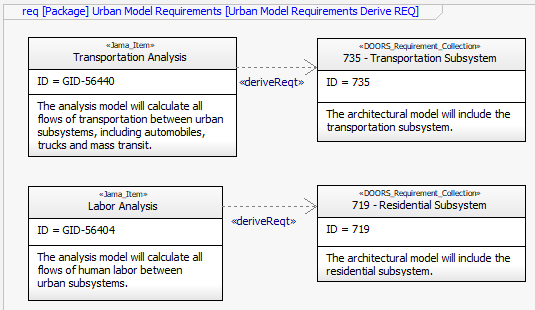 In the next post, we will decompose our urban systems structure in SysML and relate it to our model requirements. In this and the following posts in the series, we will provide alternative versions for SysML modeling in Cameo System Modeler. Both SysML models will be made available for download with the final installment of the series.